It's 11:14 in Casarza Ligure, Italy right now. 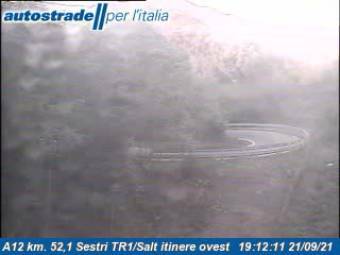 Traffic A12 - KM 52,1 - Sestri TR1/Salt itinere ovest A view of the current traffic situation. Sestri Levante: Baia del Silenzio, 2.5 miles away. Moneglia: Beach Promenade, 3.2 miles away. Deiva Marina: Albergo La Marina, 5.1 miles away. Deiva Marina: 180° Beach Panorama, 5.1 miles away. Lavagna: Traffic A12 - KM 42,2 - Lavagna itinere ovest, 5.8 miles away. Chiavari: Traffic A12 - KM 39,5 - Tirreno Est itinere nord, 7 miles away. Chiavari: Traffic A12 - KM 39,7 - Chiavari itinere ovest, 7 miles away. Framura: Traffic A12 - KM 65,0 - Svincolo Tarquinia itinere sud, 7.1 miles away.